in the grand Italian churches, which in reality are flat but convey the illusion that each block is a stairstep beneath your feet. The distinctive two-coloured patterned knitting which is widely known as ‘Sanquhar knitting’ takes its name from the small parish and ancient burgh of Sanquhar, located in the south of Scotland in Dumfries and Galloway, on the River Nith. The wool trade had been an important one in the coastal trading towns of Dumfries and Kirkcudbright since medieval times and by the 18th century Sanquhar had developed as an inland market centre. The Sanquhar Wool Fair, held in July, regulated the prices for the south of Scotland. The beginning of the 19th century saw the end of the prominence of hand-knitting in the local economy. Fortunately, the oral traditions carried on, passing from one generation to the next the skills necessary to continue this unique local craft. 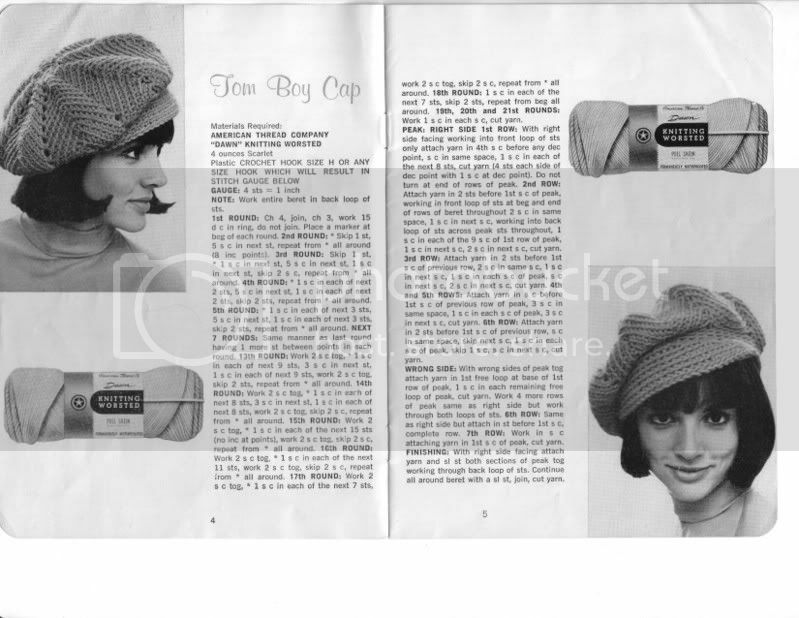 It was not until the 1960s that the main patterns were published by the Scottish Women’s Royal Institute. 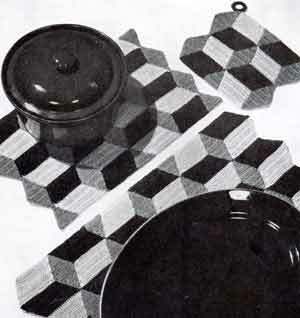 Today, there are about a dozen known, named, traditional patterns with as many variations of cuff patterns. Some of these have interesting historical anecdotes as to their origins, such as the most popular and most commonly knitted one, the ‘Duke’. Patronage by the local gentry (the Queensberry and Buccleuch families) which was important economically in the 18th and 19th century, became a matter of prestige and honour in the 20th century. 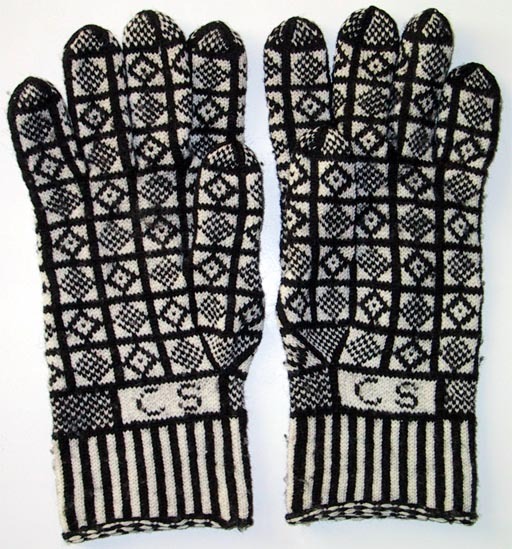 Visits to the Royal Burgh of Sanquhar by dignitaries and royalty, as well as honours conferred on people, have all been commemorated by the naming of a pattern or the presentation of a pair of gloves. 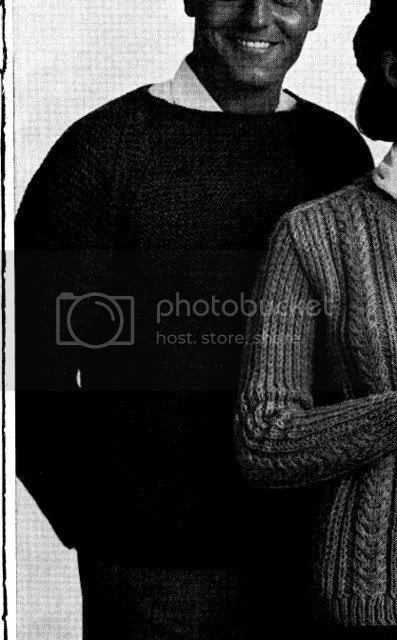 One of the lesser known patterns is the ‘Glendyne’, knitted in 1922 by Jessie Wilson for Robert Nivison who, when elected to the peerage, took the title Lord Glendyne of Sanquhar. Another is the ‘Fleur de Lys’ reputed to date from the time of the Napoleonic Wars when French prisoners were in Sanquhar. Now the dedicated knitters at the Japanese website tata-tatao-to have developed a pattern based upon the research they completed on an original glove. They do not claim certainty that their pattern incorporates the traditional techniques. Beware: this doesn’t look easy. But it sure is impressive! Good luck, and let the knitting begin! 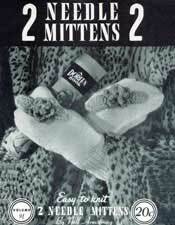 Doreen knitting book #91, 1945. Sizes from infants to men’s. Scroll down a bit to see the patterns, by size.